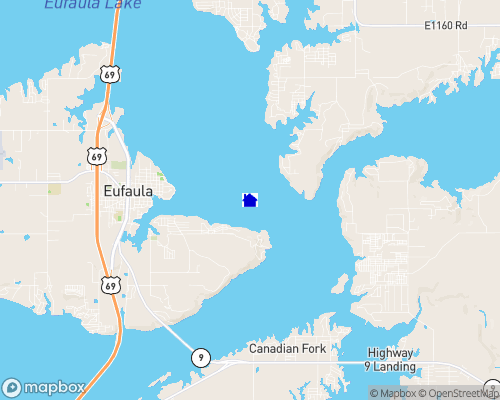 When considering lake homes for sale in Oklahoma, you should keep Lake Eufaula high on your list of destinations to consider. As the largest lake situated solely within the borders of the state, Lake Eufaula is a treasure to the many communities that line its shores. Lake Eufaula attracts the attention of fishing enthusiasts, hunting aficionados, and nature conservationists alike with its impressive landscapes and lush wildlife. Lake Eufaula’s 600+ miles of sh ...Learn more here! Lake Eufaula’s 600+ miles of shoreline vary from pristine sandy beaches to sheer cliff faces and bluffs. Anglers of all skill levels appreciate the diversity of the scenery, and they especially like that their next big catch is always within reach. Head below the tail waters of the dam to increase your chances of nabbing a whopper of a striped bass—they’re known to reach up to 40 pounds in this area of the lake. You’re also likely to catch catfish, crappie, sand bass, and white and black bass. Fishing is a year-round sport on Lake Eufaula, as many of the marinas are equipped with heated, enclosed docks. There are countless reasons to take to the waters of Lake Eufaula. Lake home owners have lake access using any of the boat ramps to deploy their watercraft of choice, or they’re welcome to rent boats and equipment at many of the marinas. Whether you prefer a slow, leisurely ride on a pontoon boat or a speed-soaked romp on a jet ski, Lake Eufaula can accommodate your recreation needs. Hiking, cycling, ATV, and equestrian riding trails circle Lake Eufaula and its lake-view cabins, yearning to be explored. And 31,800 acres of public lands are devoted to hunting, where you may encounter ducks, geese, quail, and even deer. The Lake Eufaula State Park also features stunning golf courses that capture the picturesque beauty of the lake itself. The Fountainhead Golf Course showcases Lake Eufaula on the third hole, where the lake provides a striking backdrop to the 200-yard par three. If you’re interested in having a house on any of the area golf courses, visit GolfHomes.com for property listings and details. Eufaula proper is seeped in history, and you can’t help but feel it throughout the town. From the Native American tribes that first cultivated the region to the gangs of outlaws that left their indelible marks on the history books, the town's history lies just beneath the surface. In fact, one rock-hard piece of Oklahoma history rests beneath the surface of Lake Eufaula even now. Standing Rock once served as a guidepost for early Spanish explorers, but it is now concealed by the lake’s high water line. Explore all the treasures Lake Eufaula has to offer and leave your own mark in the local history books along the way. Lake Eufaula, with over 600 miles in shoreline, is the largest lake in the state and attracts not only hundreds of thousands of visitors but also permanent residents who commute to jobs in surrounding cities and those who build vacation homes or retirement homes to enjoy the serenity and beauty of the area. Lake Eufaula took 8 years to develop and President Lyndon B. Johnson was on hand to dedicate the Eufaula Dam in 1964. The dam is located about 27 miles beyond the point where the Arkansas and Canadian Rivers converge. Lake Eufaula abounds with largemouth bass, sandbass, crappie, and channel catfish. When the lake was created, special attention was given to make the fishing population a major factor. Trees and brush to provide natural feeding and spawning areas were left in place . . . and while many a lure have probably been sacrificed under the guise of "the one who got away," hundreds more have pulled in more fish than you can imagine. The area is host to many tournaments for the serious competitors, with the annual Crappiethon the better known. For those who want to combine the scenic enjoyment with the possibility of hooking a big one, quiet coves offer the perfect place to indulge in both pastimes. You can rough it with campsites in abundance, or stay in luxury at one of the resorts that have been built around the lake. The lake boasts of not one, but two outstanding resorts. Fountainhead Resort Hotel and Conference Center is located at the north end of the Fountainhead State Park. Arrowhead Resort and Gaming Center is on the opposite end of the lake. Built of native stone and rough timbers, Arrowhead becomes part of the rustic scenery that makes the resort a popular place to stay.